*A special Thank you to Torani for providing some of the ingredients for this recipe. It’s great partnerships like these that allow me to continue to bring you inspiring content! 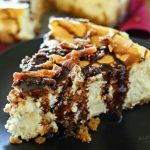 Bacon Bourbon Caramel Cheesecake is bourbon caramel flavored cheesecake, topped with crispy bacon & drizzled with chocolate-caramel. It’s an easy cheesecake recipe you don’t want to miss. Today we celebrate the hub’s birthday. That’s always fun because that means good food & of course something delicious for dessert. Because we just celebrated my youngest’s birthday last weekend it’s been treats overload around here & I have been a baking maniac. When I met the hubs I found out that his grandmother would make him a cherry cheesecake (no-bake version) every year for his birthday. So over the years I not only learned how to perfect her recipe, but I also have tried my hand at making new versions from time to time. This year I really wanted to push the limits & make a what I would consider a “man’s cheesecake”. Bacon, bourbon- those are things all the dudes in my life love. So of course I had to include those in this insanely delicious dessert. I have to say, when you have never added bacon to a dessert before, it can be a little scary. 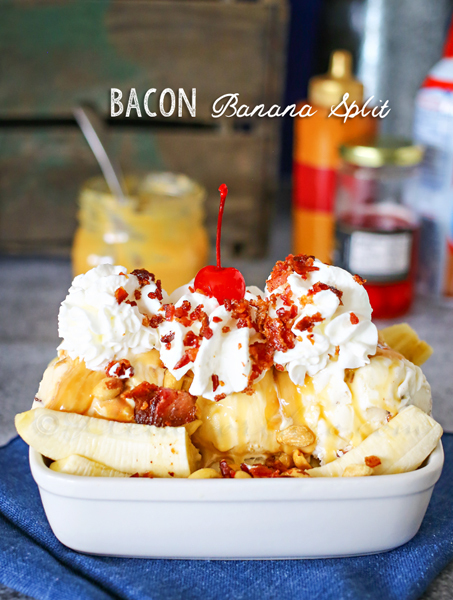 Last year for bacon month I added it to an ice cream sundae. I was worried I would ruin both the sundae & the bacon. But let me put away your doubts. This is the perfect blend of salty & sweet. Oh my heavens, it’s crazy how well these flavors blend together. You have to try it. 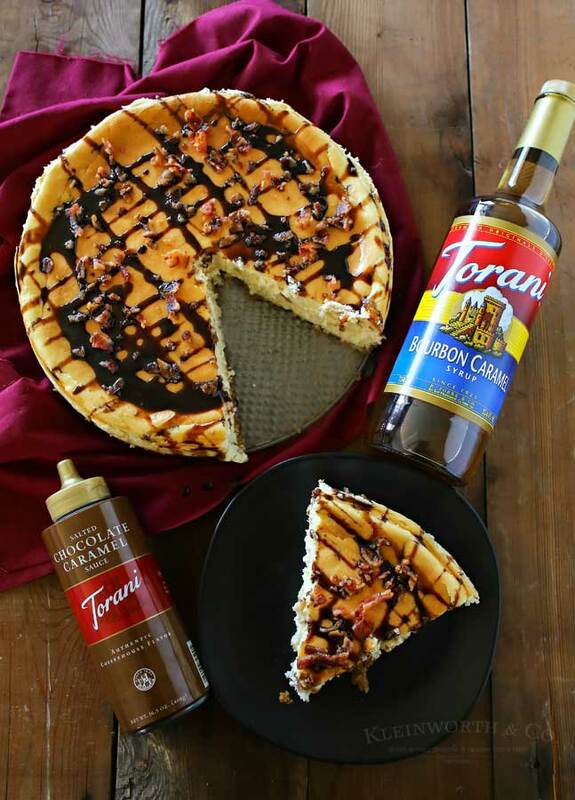 For this cheesecake I used bourbon caramel syrup & chocolate caramel syrup from Torani. I also used my 10″ springform pan & this roasting pan for it’s ability to hold a 10″ cake pan. Torani was kind enough to send all of us hosting bacon month a nice supply of great Torani products to keep us going through the holiday baking season. (which will be here before we know it) I love using the syrups because I can get that great bourbon caramel flavor in the cheesecake- without adding bourbon. Which means everyone in the family can enjoy it. 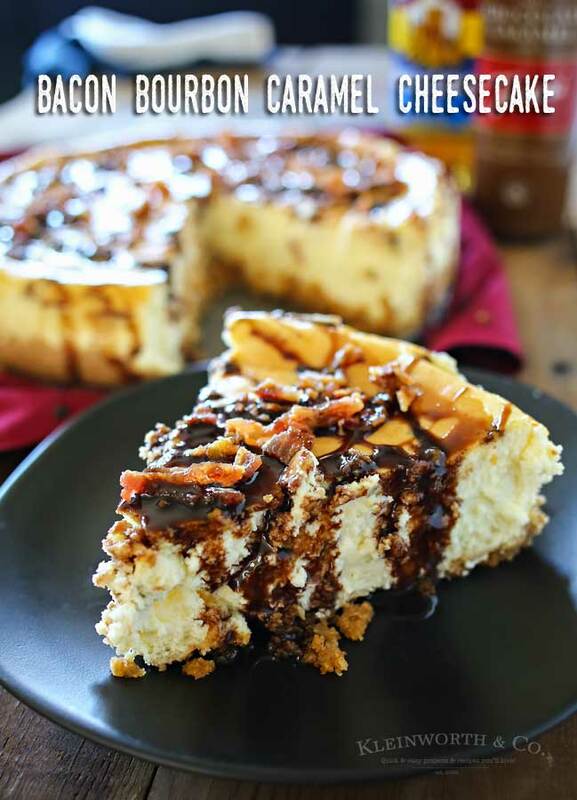 Bourbon caramel cheesecake topped with crispy bacon & drizzled with chocolate-caramel. Press the mixture into the bottom of 10" springform pan and slightly up the sides. Wrap 2 layers of foil around the outside of a 10" springform pan making sure to cover the bottom and sides. Use an electric mixer with paddle attachment, combine cream cheese & butter & beat until smooth. Add eggs one at a time until blended. Place pan in preheated oven & carefully pour boiling water into roasting pan to fill halfway up sides of cheesecake pan. Bake 2 - 2.5 hours, or until cake is lightly browned on top. I baked 2 hours & then turned on my convection for another 30 minutes. This cheesecake is OFF THE HOOK AMAZING! No doubt! 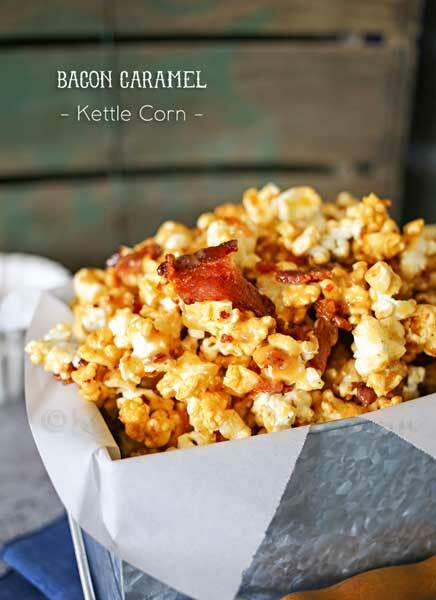 Looking for more great bacon recipes? 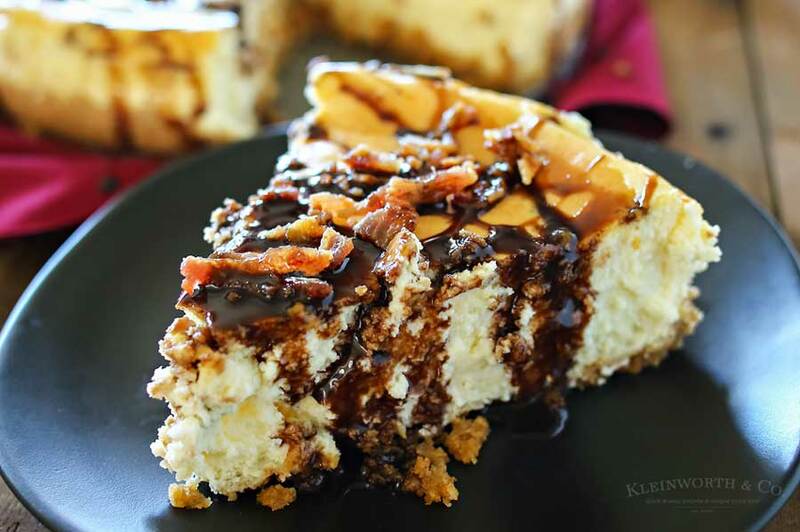 Bacon Bourbon Caramel Cheesecake from Kleinworth & Co.
Sweet Mother of Pearl this looks good! This is so worth every calorie and I would eat it without an ounce of guilt. You are right about that Sandra – totally worth every calorie. Thank you so much – it was quite delicious! Decadent. Thank you for sharing with us at #HomeMattersParty. We would love to have again next week. 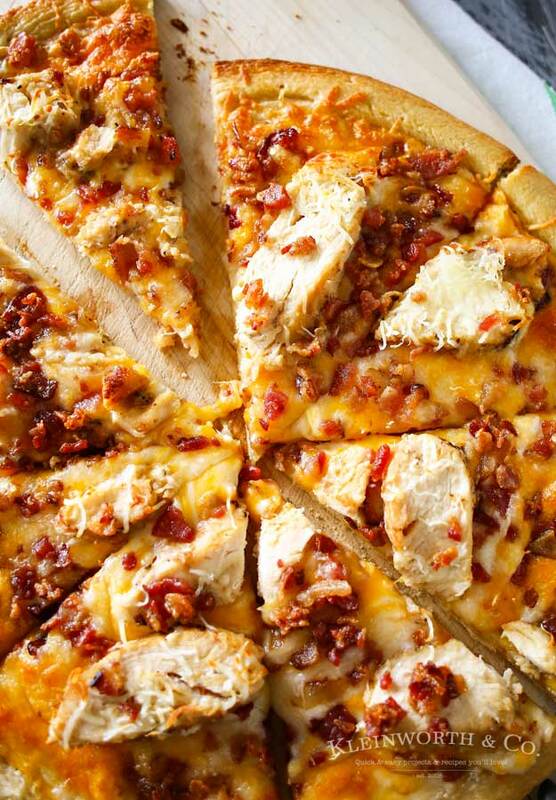 Never would have thought to add bacon to cheesecake but anything is better when you add bacon. Wow. Thanks for being a part of Let’s Get Real Link Up. Do you buy the Bourbon Carmel sauce or make it? If you make it may I please have the recipe? I used the bourbon caramel sauce from Torani that you see in the photos. There is a link in the post that will take you to where you can easily buy it. I have also found it in some of my local stores.